It was an air-launched ballistic missile that the United States started developing with the United Kingdom in the 1950s. Under JFK, Defense Secretary Robert McNamara determined Skybolt was a boondoggle that was much too expensive. The sensible thing to do was kill it. But for the British it was very important. It was their only path to maintaining an independent nuclear deterrent. There was an alternative, the Polaris submarine launched ballistic missile, but the U.S. didn't want the U.K. to have it (for various reasons that were very important at the time.) 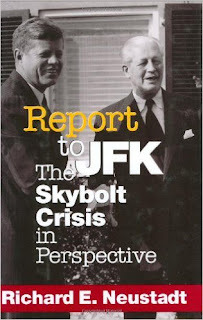 The issue was playing out up and down the U.S. and British national security bureaucracies until, at a summit at Nassau in the Bahamas, JFK was blindsided on this issue. He was not happy and had the distinguished scholar of the presidency Professor Richard Neustadt, write a report in April 1963 and it was handed in on November 15. Kennedy read it over the weekend and handed the report to the First Lady and said, "If you want to know what my life is like, read this." Sadly, that was the only feedback Neustadt received. The President travelled to Dallas on November 22, the rest of the story is well-known. Having survived the Cuban missile crisis in October 1962, Kennedy looked forward to his meeting with Prime Minister Harold Macmillan. Then, as now, British Prime Ministers and U.S. Presidents were often friends - as much as two politicians can be friends. But the British delegation was not in good humour, and they demanded a resolution on Skybolt. The discussion continued, the Americans were unwilling to continue the program and sought formulae in which the British would be part of a joint NATO nuclear force. But this was unacceptable for a proud nation. There must be Skybolt or the British must have Polaris. After that, Kennedy relented and agreed to share the Polaris with the U.K. It led a great expansion of the special friendship. I could analyze this. Macmillan made his appeal and smart combination of emotional and hard political points. U.K. too had its history and values, which could not simply be ignored. At the same time, there would be an impact on British domestic politics which would not be favorable to the United States. It is not just about getting a deal. There is a relationship that continues on in time and space. But perhaps I should just let the words speak for themselves. Allow me to quote another eloquent Englishman who pre-dated Macmillan by a few centuries. When you push countries around, expect to be pushed back.